The first eating adventure of 2004, and the start of our third year of food gatherings, was one of our most memorable. Eugene gets the credit for bringing Tandoori Hut to our attention; the meal was so good we still talk about it. 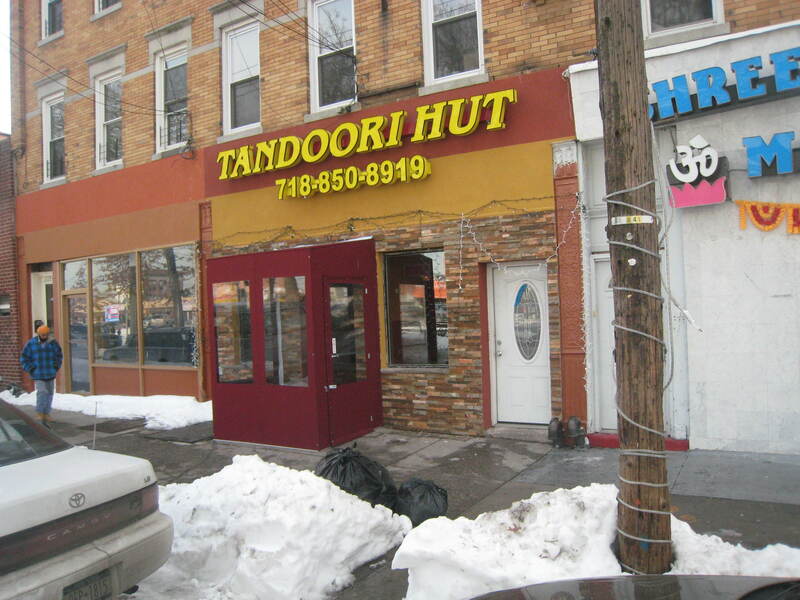 If we compiled a top ten over the years, Tandoori Hut certainly would have made it into the top five. Below is what we experienced on a cold winter’s night seven years ago. It took almost two years of our gluttonous gatherings, but finally, due to ten inches of snow, we were forced to postpone. None of us, with the very notable exception of Zio who was still stuck in the frozen tundra of East Hartford, can go very long without our exotic food fix so we were able to convene the following night at our assigned (by Eugene) destination of Tandoori Hut in Richmond Hill, Queens. Driving down the stark stretch of Atlantic Avenue, we were immediately reminded of our last venture to this region when we feasted on jerk pork lo mein and curry goat at the Guyanese-Chinese hybrid, the festive Atlantic Bamboo Gardens. Tandoori Hut was easy to find; it was just across the street from the Punjabi Palace. This was obviously curry central of Richmond Hill. Save for one other couple, Eugene was sitting all alone when we arrived at the very dimly-lit restaurant. 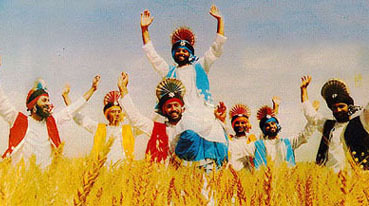 I took a seat facing the television which was showing a succession of music videos called “Punjabi Gold;” a Bollywood version of MTV. There was music playing but I wasn’t sure it corresponded with the videos; thankfully there were subtitles making it easier to follow the intense drama of the videos. After ten minutes I had enough of Punjabi Gold and was more than ready for some tandoori. Our waitress attempted to get us to order, but when we asked for the usual help with the menu, embarrassed by her difficulties with English, or ours with Hindi, she turned to a man who seemed to be the owner. He was seemingly confident, accustomed to dealing with our type; non-Asian and looking for a taste of the exotic. We asked for his recommendations. Tandoori being their specialty, he led us to the mixed tandoori special along with a tandoori fish. When we prompted him to continue—to suggest more items on the menu, he seemed unprepared. Gerry asked about a vindaloo. “But vindaloo is very hot,” he said. Yes, we want hot, we replied. He seemed doubtful and then shrugged. “I’ll make you a fish vindaloo,” he said warily. And some saag paneer, dal, basmati rice, and more bread, we added. “I’ll make you a garlic nan,” he said. Eugene inquired if we had ordered enough. Our waiter shrugged, he was obviously unaware of our almost limitless capacity for food consumption. The first thing to hit the table was a huge mound of sizzling tandoori meats. It didn’t look pretty, what we could see of it in the dark, but once it stopped sizzling and when we tasted it, especially the chicken, we knew we had found tandoori nirvana. Besides the chicken there were pieces of spicy lamb sausage and what we thought was lamb, but was actually dark meat chicken coated in a rich brown paste. The tandoori fish followed; pieces of salmon roasted in the restaurant’s tandoori oven and perfectly moist. The fish vindaloo also salmon was also incredibly tender. Gerry complained that it wasn’t hot enough; yet after a few bites there was that residual heat that is so much more effective than that first quick hit you sometimes get with spicy food. The garlic nan was more potent than any garlic knot or garlic bread I’ve ever experienced while the saag paneer was a very nice cooling alternative to all the heat on the table. Our meal at Tandoori Hut was blessed. While we were devouring the platters in front of us, the restaurant was slowly filling up with groups of Sikhs. An Indian restaurant that has a loyal following of Sikhs definitely has something going for it. After the ignominious Uncle George’s Greek Tavern experience, we were all very happy to have found our touch again. As is our practice, we finished everything on the platters and when our waiter asked if we wanted “something sweet,” all we could do was shake our heads. Something sweet might interfere with the pleasant party that was still going on in our mouths. 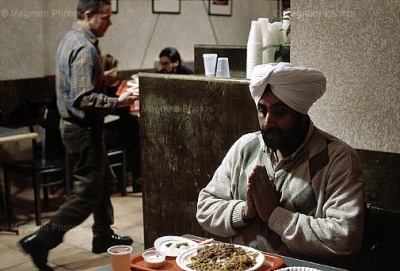 Instead, we gathered our heavy winter garb, leaving their Sikhs to enjoy their meal, and headed out onto frigid Atlantic Avenue. A year after dining at Tandoori Hut, Frank Bruni wrote glowingly about the restaurant in the New York Times, “Diner’s Journal.” Scooping the Times was satisfying for our group. It was one of our objectives; to find restaurants before they were truly discovered. As we all know, once the Times mentions a place, that place is changed forever and often not for the good, especially in the cheap eats universe we travel. Despite how good Tandoori Hut was, I haven’t returned though desperately want to. I did, however, pass the restaurant and noticed it was in the same location and with a slightly more attractive sign. Otherwise, it looked like nothing had changed at all…despite Frank Bruni’s praise. How about the olfactory experience, the odors of the kitchen, the dining area, the host/hostess and the wait staff ! And please make mention of the rest facilities as well… May the only surprise I receive be at the dining table ! BON APPETIT !